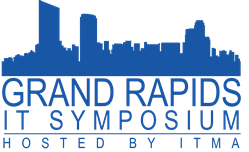 The Grand Rapids IT Symposium is West Michigan’s annual major gathering of leaders, professionals, and academics working in the I.T. field. As technology continues to redefine the boundaries of industries and replace markets’ traditional geographic regions with borderless digital environments, it has become essential for local organizations to be aware of the global trends in their sectors and implement strategies to integrate them into their operations in order to be able to stay agile and maintain their competitive edge. This year’s symposium will look at emerging I.T. trends and provide insights into innovative leadership skills in today’s fast-paced digital age. This interactive event will also provide attendees with opportunities to collaborate and share their knowledge and experiences through a series of panels, break-out sessions, and social media. CK Kerley, keynote, futurist and professor, will take you on a tour of the next-gen technologies that belong on your radar, in your plans, and at the forefront of your 2018-2020 IT goals with her keynote titled “Tech Megatrends”. Yesterday was about billions of smartphones—but tomorrow belongs to the trillions of smart things digitizing the physical world. The AI Arms Race is officially on, and IT leaders must turn their operations into “real-time, data-driven, know-it-all organizations” to maintain competitive advantage. Digital transformation is our destination . . . and blockchains may well hold the key in getting us there. As headlines of job-killing robots abound, the robot’s real story escapes our view: Automation’s not taking our jobs away, it's giving executives back their time. Freed from administrative tasks, the “CoBots” will liberate employees to create new forms of value. A Reskilling Revolution—unrivaled in size, scope, and scale—will prepare our people for this fast-approaching future. And leap we must, while many in the US view disruption as a big threat, China sees it as a BIGGER opportunity (and is investing the billions to achieve it). The lunch keynote, titled “Why Would Transnational Criminal Enterprises and Foreign Intelligence Services Want to Target my Organization's Data or Intellectual Property”, will be delivered by Scott Augenbaum, FBI retired supervisory special agent. In this keynote, Scott will address the question: Are we prepared or are we the next victim? During his career with the FBI, almost all of his hundreds of victims never expected to become a victim, because they didn't believe they had anything worth stealing. Think again. Scott has responded to hundreds of data breaches and will share with you the commonalities in almost all incidents and provide you with several takeaways to prevent your organization from becoming the next victim. The Grand Rapids IT Symposium is proud to announce a high-level executive panel for the closing keynote. They will bring in four highly engaging and influential CIO’s from West Michigan to discuss Digital Transformation with the panel session titled: “If "data is the new oil" - how are you extracting value from the data you have? This panel will discuss how they have approached getting value from their data, examples of how it has impacted the business, how their organizations are becoming digitally enabled and where they are on the journey, what are they doing to help the organization know what “digital” means, where their focus has been in regards to digital transformation, and what struggles they facing to become a digitally enhanced organization. In addition, there will be 12 breakout sessions and panels throughout the day focused on security, innovation, growing the local talent pool, machine learning and AI, cloud migration experiences, building an Analytics culture and much more. John Dean, Collaboration Champion with the ITMA, will serve as the master of ceremonies for the day. Attending the 2019 Grand Rapids IT Symposium is an opportunity for leaders engaged in technology to network and explore new ways to maintain competitive advantage in a global economy. The ability to collaborate and exchange actionable information with peers makes this event rewarding and productive. If you and your team would like to join us for a terrific day of education, networking, collaboration and celebration, please register your team here.